All the money you donate will go directly to supporting The Social Studio who work with young people from refugee backgrounds living in Melbourne, Australia. These young people develop their self-esteem, skills and employment prospects using fashion design as a starting point. You can donate by using either PayPal or the Australian online donation site GiveNow. 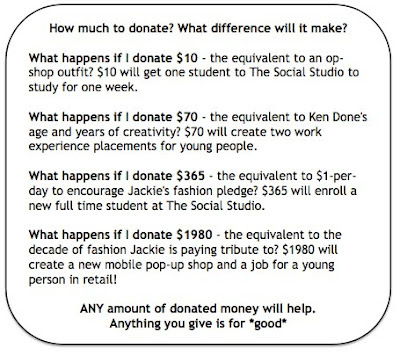 The Social Studio is a registered charity. All donations over AU$2 are tax deductible (in Australia). When you make a secure online donation via the givenow.com.au website, you will receive a receipt / tax invoice to your chosen email address. Thank You so much for supporting the *good fashion for good* movement!